**What is this book’s genre? Is this the genre you usually write in? Are there any genre’s you haven’t written that you’d like to try?It is YA Urban Fantasy and it is the first of six books in the series. Actually, I have written and illustrated nineteen children’s books—in another life, I feel like—including the best-selling series The Rumpoles and the Barleys. They are all out of print now. I also write a lot of essays and I have a childhood memoir and a work of literary fiction that I have just finished. 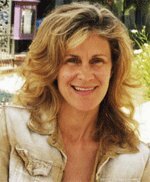 I write my literary works under the name Karen Hunt and my YA works under the name KH Mezek. I would love to write a mystery/suspense series. But right now, I am completely enamored with the Night Angels! What inspired you to write this book?There are a number of things that inspired me. First, I am a single mother and raised three kids in the San Fernando Valley, considered to be the most culturally diverse community in the United States. We lived just over the “railroad tracks” from Calabasas, the new Beverly Hills of Los Angeles, made famous by the Kardashians. The town in my series, Oak Haven, is a take-off of Calabasas. It peels back the perfect façade to show the reality of the drugs and violence that teenagers face, no matter what neighborhood they grow up in these days. Part of my dedication is to all the artistic and outsider kids who congregated at my house. I cofounded a creative writing program for incarcerated youth, called InsideOUT Writers, and I was inspired by the incredible life stories that I heard from these kids at the writing table. I am inspired by my childhood travels to over fifty countries and my experiences living abroad as a child and as an adult. The NIGHT ANGELS CHRONICLES has many incredible characters from all over the world. I am inspired by my life-long pursuit of martial arts training and my training in boxing, kick-boxing and Eskrima—stick and knife fighting. I also teach in a gritty boxing gym. So, as a woman, I can write fight scenes from the perspective of actually having experienced them. Last but not least, I am a romantic at heart and I am inspired by the tragic love stories down through history, Romeo and Juliet, the love triangle of King Arthur, Queen Guinevere and Lancelot, the pathos of Othello, etc. How did you pick its title? Did it come first or did you have to write the story first?The title of the book and the series just came to me, I don’t know why or how. I knew what I wanted the series to be about and I knew that it involved a key. It seemed an obvious and powerful title. How did you create your characters? Did you use any real life people in their making?My character were inspired by all the fascinating young people who congregated at my house and the equally fascinating ones I met in juvenile hall and around the world on my travels. The evil Ancient Ones were inspired by powerful leaders from history. Sera’s nemesis, Fabian Gore, was inspired by the greed of the corporate world. And Sera was inspired by my desire to create the strongest and the most fearless female superhero ever—one that I would want to be! Her love interest, Peter, is a complete creation from my imagination and the other young man in her life, Jimmy, is inspired by all the cool guys I’ve met in the martial arts world over the years. Her friend Inez was inspired by a strong Latina female friend of mine who teaches kickboxing. Who is your favorite character of this book and why?My favorite character is Sera, without a doubt. She is everything that I want young women to know that they can be. She makes mistakes, but in the end she overcomes the obstacles in her path and she learns how to stand on her own two feet and make her own choices. She really grows over the course of the six books. It was important to me to create a female lead that would give girls an example of strength and independence, while at the same time being vulnerable and falling in love and having to decide how much she is going to compromise her own power and integrity to have a relationship. What is your favorite part of this book? Can you share an excerpt from that part?I have so many favorite parts! And I can’t tell my most favorite because it is towards the end and would give away too much. I am enjoying developing the tension and complexity of Sera and Peter’s relationship since Sera can never be sure if he really loves her or if he is just playing at it so that he can get the key. So, here is Sera’s first real conversation with the Night Angel, Peter, who claims to be there for her protection, and with whom she is fast falling in love.“So, tell me something, anything, because I don’t know what to ask. I don’t even know if this is a real conversation.” I was desperate. If this was just another hallucination, I might as well get as much information out of it as possible—for clues as to my twisted mental state. For a moment, Peter didn’t answer. He sat straight and stiff as if he were a prince on a throne, staring past me and gathering his thoughts. Then, he spoke. And it was as if, for a few brief moments, his defenses were down. As if he was longing for something that once was and would never be again. “The warlike days are over. Blood is too precious a thing in these days of dishonorable peace; and the glories of the great races are as a tale that is told.”I blinked. “Okay…”He blinked back and then sneered, the spell gone. “A quote from Dracula, you know, the book you claim to like so much? It is an excellent account. It tells some of the story, while those other ones they write now...” His sneer became positively evil. “Ignorance is the greatest flaw of humanity. Ignorance and fear.” He paused again, struggling to find adequate words. “How can I explain such an incredible life, and yes, such a terrible one? As a boy, I was stolen from my family in the mountains of Slovenia by an Ottoman sultan, and trained as a warrior to fight against my own people.” He laughed tersely. “The Ottoman Empire, the rivers of blood that flowed. It’s something you learn about in history class, yes? Are you a good history student?”I shook my head honestly. “It never seemed that interesting to me.”“And why should it? When your history books are filled with lies. I am an eye-witness. I lived those terrors. I committed unspeakable acts of violence against my own people, brainwashed as I was to be a bloodthirsty assassin. All who came against me fell. Truth was repressed by those in power: the turning of the First Born vampire, the gruesome wars waged by the vampire lords, and then the evolving of our race into denizens. Our pact with the angel Michael.”He paused as if struggling against some deep and terrible emotion. “That sultan, his name is Mehmet II. He has many names. He is a First Born. He is the one who turned me. Into this.”I couldn’t speak. There were no words adequate to respond to what he had told me. Five hundred years of pain, pleasure, life and death, and most of all knowledge, brought together into this boy/man sitting in front of me. It was too mind-boggling, too intoxicating. I leaned forward, consumed by the desire to know more. “Please.” It was all I could say. But in a flash, Peter’s eyes grew hard and dangerous, as if he found my sudden curiosity in bad taste. “I'm not here to amuse you with stories, stories that are unfit for a young girl's ears. I am a denizen lord. You are a mere mortal. Weak and ignorant. Do well to remember that.” I felt as if I’d been slapped. It wasn’t my right to decide anything, even the direction of a conversation. He was the denizen lord while I was a mere human. Maybe that made me even less than a dog or a rat in his eyes. I had been prepared to tell him everything—my fears about what had happened to my dad, the attack at his office, and the paper with the coordinates. I had wanted to pour out my heart, sure at last I had found the right person who would understand. Now, I felt my heart closing again, tighter than ever. What was the hardest part of this book to write? Can you share an excerpt from that part?Overall, with the series, a big challenge has been creating the history of the Ancient Ones and the Night Angels. The series has a firm foundation in historical facts and I think that’s one of the added bonuses that makes it interesting to read. The hardest part of the book to write, again, was also my favorite part at the end and it deals with the relationship between Sera and her brother Salem. I can’t share it because it would give away too much. But another hard part is the ongoing dynamic between Sera and the sinister mayor, Fabian Gore; to make it truly like an electric explosion on paper. Here is her first encounter with him in person, where he tries to seek control over her and possess the key. All the suppressed pain over my father’s death from the past few weeks, all the doubts and fears, exploded to the surface and I struck out at Gore, hitting him full force across the face. He didn’t flinch, he didn’t even blink. It was as if my blow had never happened. I realized that he was holding my arm in an iron grip, and I had no idea how it had happened. The touch of his cold flesh brought nausea, and numbness was creeping up my arm. My strength was ebbing fast, as if a current ran from him through me, drawing out my energy. I tried to pull away, but it was impossible. I gritted my teeth. I would not let this monster control me. I would close my mind against it. I would. Gore took a step closer, so close his bone-white face was a mere inch from mine. He spoke, his voice soft and sympathetic. “The truth hurts, Sera. We make up fantasies because we don't want to see it. But eventually, we all must face our demons. Have you faced yours?”I shut my eyes tight and turned my head away. “I’m not listening to you,” I said, but my voice faltered with uncertainty. How did I really know what was true? I’d heard so many different opinions, so many people pulling me in opposite directions. No. I knew what was true. I did! This man was evil. He had killed my father.“Look at me, Sera.”I would not do it. I would not.But slowly, I felt my chin lifting, as if an outside force was pushing it upwards. Against my will, I found myself gazing into Gore’s eyes, staggered by their invincible power, beauty, and limitless knowledge. “Come with me.” Gore spoke with such gentle kindness, his words entering my body like a warm, delicious drink, bringing relief to my frozen limbs. He was far gentler and kinder than Peter or Professor Strejan had ever been. I felt the tension leaving me and a deep relaxation flowing over my mind and body. I realized Gore was letting go of my arm. I should run away. So why didn’t I? Gore reached out his hand and I felt a strong desire to take it. He couldhelp me. All the fear and worry, all the unanswered questions would melt away if I just obeyed him. I would be free at last. Free of the past. Free of my nightmares. “Well now, looky here!” An old lady’s high, shrill voice broke into my head like shattering glass. My brain seemed to explode in an agony of sudden pain. My body wrenched backwards and a bitter bile rose in my throat. Before I realized what I was doing, I had doubled over and thrown up. Immediately, my mind cleared and my eyes focused on the disgusting mess that now lay on Gore’s shiny black shoe. “Uh … oh.” I groaned. I looked up and saw Gore was staring back at me with intense malice. “I will tear your heart out and eat it,” he whispered venomously, his hands knotted into fists as if he was controlling an urge to do it right then and there. Again, the shrill voice tore through the night air. “Hello! Excuse me. Hello.” An elderly lady in a pink leisure suit was waving energetically at us as she hurried up the stairs from the parking lot. Close on her heels were five other ladies, similarly dressed in various shades of pink, purple, and lime green. Together they were making a beeline for me and Gore. “You here for the bingo?” the pink lady asked hopefully, her sharp, leathery features creased by a smile. It was my neighbor, the one who had brought the chocolate chip cookies. She didn’t seem to remember who I was, so intently was she staring at Gore, eyelashes batting furiously. She was flirting with him! Under ordinary circumstances it would have appeared disgusting, but right now it was the loveliest sight I had ever seen. The other ladies gathered behind her, expressing their own eager enthusiasm with breathy “Ooh’s” and “Ahh’s.”The pink lady looked back and forth between me and Gore, then down at Gore’s shoes. “Oh, my goodness, are you ill, my dear?” she asked worriedly.“She is,” said Gore, putting on an air of concern. “I was just going to take her home.”“No!” Then more calmly, I said, “I’m fine, although I'm really sorry about his shoe.” I smiled to prove it before hurrying on. “I wouldn’t want to ruin your bingo. This is Mr. Fabian Gore, that’s Fabian Gore. He’s a very important man on the city council. He’s here to make sure everything is running smoothly at the community center.”Like a gaggle of quacking, wing-flapping geese waiting for breadcrumbs, the ladies surrounded Gore. No doubt within seconds he could have smashed them to little bits of flesh and bone, but of course, that wouldn’t have been good for his public image. The pink lady had taken charge of the situation. She said, “We’ll get your shoe cleaned up, Mr. Gore. Not to worry.” As she moved away, she encircled her arm firmly through Gore's. My last glimpse of the important man was of him being led past me toward the community center by the happy bingo players, his face a blank mask, his eyes on fire with rage. Did you have any special rhythm or quirks while writing this?I had the good fortune to be able to write it in a few different locations in the world. One was Istanbul. I was there in the summer of 2014 and it was magical. For about three years previous to this trip I’d known that I just had to go, one way or the other I had to make it happen. I was determined that I put the weather in Istanbul on my computer so that every time I opened it up to write, there it would be, in my consciousness. So when I finally went and was able to sit down in this amazing penthouse apartment, overlooking the Bosporus and write, wow, I can’t even begin to describe how fantastic that was. I still have the weather in Istanbul on my computer and on my phone! And now I have added Costa Rica and Morocco because I recently returned from writing in both these places. So, now I have a thing about adding the weather of all the places I am determined to go! Is this a stand-alone book or is it part of a series? If so, we want to hear about it and what’s next in the series. 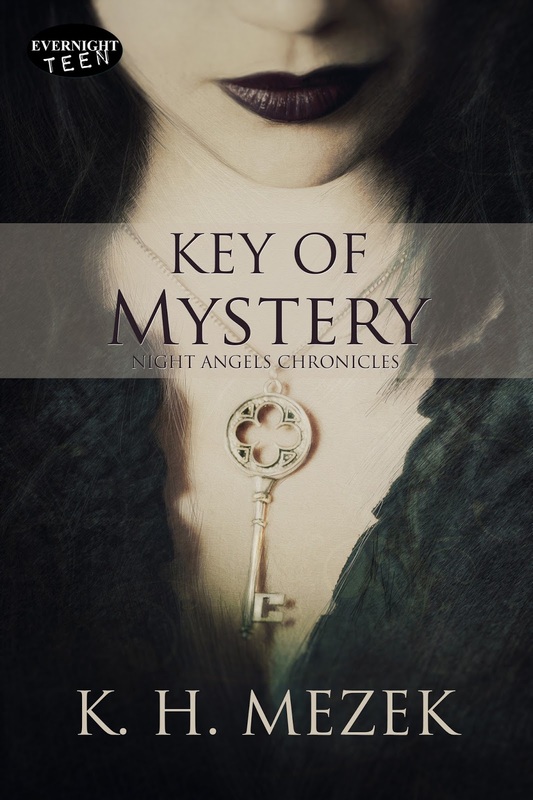 If not a series, what comes next to be released?This is the first book in the NIGHT ANGELS CHRONICLES, a series of six books, so I have my work cut out for me! I’ve told my kids to pull me back to reality if I start getting confused between the real world and the world of my imagination! Fortunately, I have the second two books pretty much finished. The titles are Key of Mystery; Book of Angels; Cave of Secrets; War of Demons; Throne of Desire; Door of Destiny. 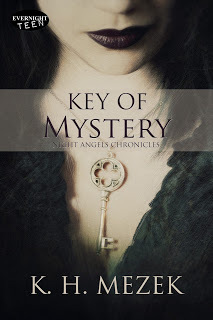 I can’t tell you what happens at the end of Key of Mystery, but it is something terrible between Sera and her brother Salem, which forces them to become enemies, fighting on different sides, although they still love one another. In Book of Angels, Sera finds herself transported to an ancient castle in Slovenia, where she and Peter have a rather heated encounter. Then Sera and the Night Angels are off to Saint Catherine’s Monastery in the Sinai Desert where Sera confronts the most Ancient one of all, Queen Ahhotep, who is imprisoned in the Life Box. Someone is feeding her power and the worry is that she will escape and wreak havoc on the world. Once back home, Sera must battle zombies under the city of Los Angeles and destroy a Mask of Power, not to mention deal with her drug-addicted mother, who is under the spell of Sera’s nemesis, the mayor, Fabian Gore. Continuing on her quest to find out what happened to her father, Sera discovers the Book of Angels, in a vault in the LA Central Library, but I can’t really talk about what happens in that vault! And of course, she continues to try and resist her feelings of love for the Night Angel, Peter.